and the Google Apps Marketplace, starting with how to make a great first impression on your users. Today we're continuing that series with an eye on collaboration and the various "people" APIs in Google Apps -- Contacts, Shared Contacts, Profiles, and Provisioning. Why contacts? Contacts data is used pervasively and makes it easier to share documents, arrange meetings, or communicate in general. It's synced with mobile phones & email clients. 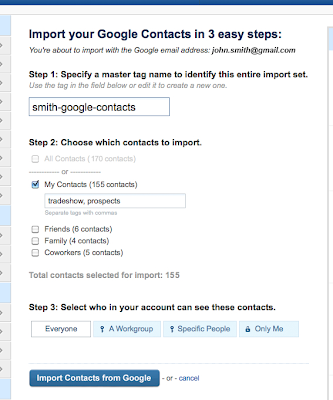 Many apps in the Google Apps Marketplace use contacts to help users share projects and assign tasks to coworkers. In short, the contacts APIs act as a hub for applications and devices to share important information about the people users communicate and collaborate with the most! Before jumping in to how to use these APIs to make work easier for users, let's take a step back and look at the role of each API. Contacts API - This API provides access to an individual user's personal contacts & is available to all users on all editions of Google Apps. Each user manages their own contacts separately. Shared Contacts API - The shared contacts API is available only to Google Apps for Business and Education editions, and provides a way for domain administrators to manage a global address list of external (non-employee) contacts viewable by all users in the domain. Profiles API - Like the Shared Contacts API, the profiles API is only available for Google Apps for Business and Education education, and is managed by domain administrators. But while shared contacts can be used to manage contact information for people outside the domain, the Profiles API is exclusively for managing contact information for users in the domain. Provisioning API - A distant cousin of the others, the Provisioning API allows domain administrators to manage users, groups, and organizational units in their domain. While the full version of the API is restricted to Google Apps for Business & Education editions, all editions support a read-only view of the data and it can be a quick and easy way to discover organizational information for a domain. As mentioned in our earlier post on creating a good initial experience, these APIs, can be a great way to help administrators set up and configure applications quickly. The provisioning API in particular is well suited to this and provides user, group, and organizational data for a domain. Expensify uses the provisioning API to quickly configure roles and reporting relationships for submitting expense reports. There are a variety of ways to use the various contacts APIs to help users save time and be more productive. Project & task management apps often benefit from importing contact information to speed user entry. Manymoon's project management app helps users assign tasks quicker by auto-completing names as the user types. Likewise, CRM and marketing automation apps can also speed user adoption and reduce the need for time consuming data entry by importing existing customer data stored in contacts. For applications that aim to be the system of record for contact or employee information, pushing data to Google Apps can be a big win both for users and developers. Syncing contact data with Google Apps means syncing with every other application and device that syncs as well. It allows developers to magnify the reach of their integrations and lets users access important partner data no matter what the context. Full bi-directional contacts synchronization is more challenging. It can be equally rewarding. Not only does it allow users to edit contacts in context, it can enable innovative new services that seamless enhance data without disrupting how users work. 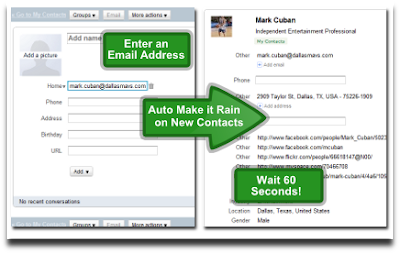 Rainmaker's bi-directional sync automatically enhances contacts with data from social networks and other sources. While the example so far have focused on the Contacts API and individual users, synchronization with the Shared Contacts API can provide added value for larger organizations on Google Apps for Business. As our friends over at Manymoon wrote not too long ago, they learned three key lessons about what it takes to be successful in the Google Apps Marketplace: Appeal to a broad audience, integrate deeply, and demonstrate immediate value. Integration with contacts & provisioning APIs is a great way to do accomplish those goals that just about any app can benefit from! A while back we began a series of articles about integrating with Google Apps and the Google Apps Marketplace, starting with how to make a great first impression on your users. Today we're continuing that series with an eye on collaboration and the various "people" APIs in Google Apps -- Contacts, Shared Contacts, Profiles, and Provisioning.